Available with us is a broad range of Leather Halters, which is precisely manufactured with premium quality leather in various designs, colors and sizes with proper polish as per the changing trends of the market. Made as per the standard measurement, these can be easily adjusted & fitted to horses of different breads. Moreover, to meet the specific requirements of the clients, our range can also be offered in custom designs, without a compromise in quality. Further, to gain utmost satisfaction, these are offered at most competitive prices. 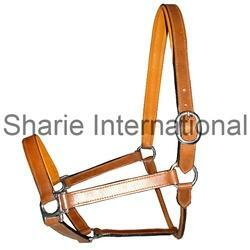 Owing to our immense industry experience and expertise, we are capable of presenting an excellent range of Brown Leather Halter for valued clients. We ensure that the complete assort offered by us is made utilizing high quality of Indian leather with fancy silver fittings and chain leads. Available in various colors and sizes, these are offered to our clients at market leading prices. Following industry standards and changing trend, we design and manufacture our range of Western Leather Halter with western silver fittings and lead chains. Moreover, to meet the diverse demands and preferences of the clients, these are offered in plethora of colors and sizes. Made with high quality Indian leather with solid brass hardware, these bridles are running high in demand due to their distinctive attributes such as. 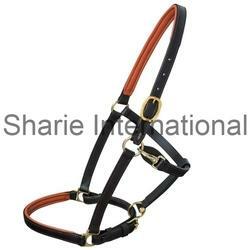 We also specialize in manufacturing and exporting a skillfully designed range of Leather Horse Halter. Genuine quality leather and other material that are procured from some of the trusted vendors are used during the manufacturing the range. Ideal for cob, pony and fully grown hoarse, these leather halter and bridle with iron hardware and reins can be availed in various colors as per the preferences of the clients. Designed and developed with utmost care and perfection, our range of Horse Leather Halter is widely used to tie up and lead the horse. Made using soft leather and advanced machines, these halters perfectly fits around the muzzle and behind the ears of horses. Running high in demand, these are carefully checked on various quality parameters to rule out even a minute possibility of defect. Backed by a team of expert professionals and modern manufacturing facilities, we have been able to offer to our clients a wide range of Padded Leather Headcollar. 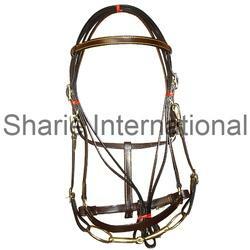 Available in plethora of colors, these bridles are specifically manufactured by our professionals using soft and qualitative leather, sourced from eminent vendors of the industry. Further, the team stringently checks the range on various parameters to ensure defect free delivery. 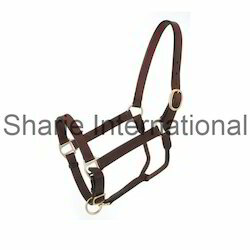 We have been widely appreciated in the market for offering supreme quality Black Leather Halter, which are designed with soft padded and iron hardware. Precisely manufactured using optimum grade leather and advanced machines, these comply with established standards of the industry and also with the changing trends. Backed by a team of expert professionals and modern manufacturing facilities, we have been able to offer to our clients a wide range of Plain Leather Halter. Available in plethora of colors, these bridles are specifically manufactured by our professionals using soft and qualitative leather, sourced from eminent vendors of the industry. Further, the team stringently checks the range on various parameters to ensure defect free delivery. Looking for Leather Halters ?